You're on the run from the law, hunted for a crime you didn't commit and unable to return to your own home for fear of being caught. A road block looms ahead, halting everyone except for an acclaimed opera singer who is performing later that evening. As the sirens echo through darkened streets, you slowly realise that the only way out will involve fashionable taxidermy, a fabulous purple wig, and a pair of lips ''borrowed'' straight from the starlet herself. Stick It To The Man is made out of moments like this, and it's a maniacal joy. In a market saturated by military shooters and first-person adventures, developer Zoink comes off as defiant in its unhinged commitment to creating something truly unique. What starts off as a competent 2.5D platformer very quickly amalgamates the puzzling style of point and click classics with some light stealth and open environments to give the genre a thoroughly modern shot in the arm. Its success can be measured by how well these elements sync up into a cohesive experience; while it's not without its shortcomings, there's no denying that the formula holds up all the way to the end credits. Players will be taking on the role of Ray, whose minimum wage job testing hard hats at a construction site is rudely interrupted when a mysterious container falls from the sky. The blow to the head leaves him with a killer headache, the attention of a mysterious group led by 'The Man', and what he ends up calling the ‘’giant spaghetti arm’ suddenly floating out of his brain. This new addition sits at the centre of the gameplay, allowing Ray to not only read the minds of those around him, but physically pluck out their thoughts and use them for a bit of brainy puzzling. It’s a neat mechanic that never ceases to amuse, as the giant purple hand takes on the role of the cursor and subconscious interrogations replace the usual item-hunting that forms the backbone of pure point-and-click titles. Neighbours, animals, even robots can be probed for information, and Stick It To The Man succeeds in always making this feel like a worthwhile pursuit. This is mainly due to the game’s fantastic script, one which doesn't lower itself to meme usage or relying too heavily on pop culture references. While there are definitely a few pokes at gaming, Facebook and a couple of famous plumbers, this title should be praised for ‘sticking’ - Ba-dum-chish - to its own individual brand of twisted humour. With much of it penned by Adventure Time veteran Ryan North, it lives up to the standard of its peers with frequent moments of laugh out loud dialogue and enough ridiculous characters to make Tim Schafer himself jealous. 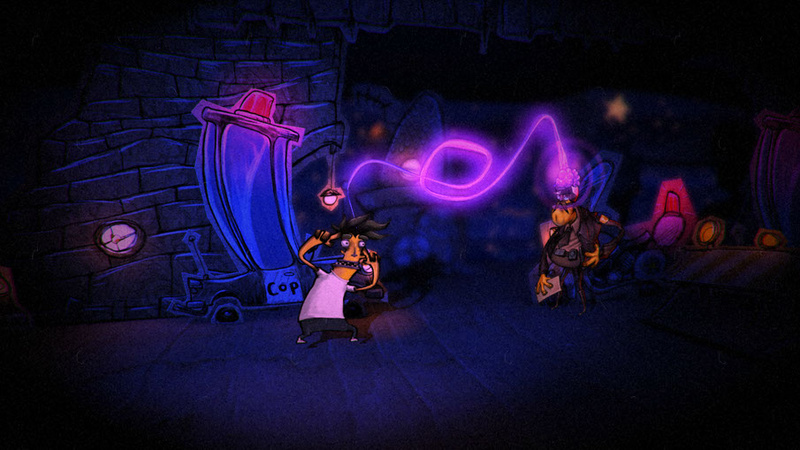 The voice acting is sufficiently zany as well, though a few odd deliveries and typos in the script can take players out of it for a moment or two. 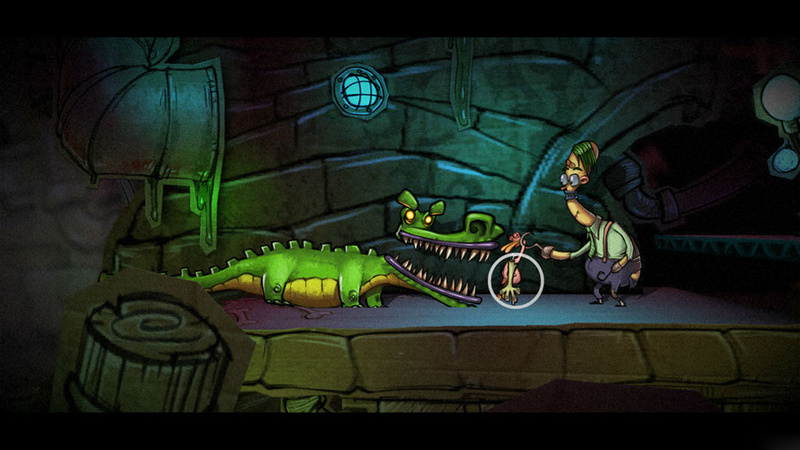 Mental adventuring aside, there's some solid platforming and exploration on offer as well. The game is split up into 10 chapters, each one representing a different area that can be navigated - not too unlike a stripped-down version of Metroid or Castlevania. A map is displayed on the GamePad, helping to mark out people of interest and how to get from place to place. Ray himself isn't exactly nimble, but using his psychic grip to zip around with flicks of the control stick ensures that moving around is never a chore. Variation helps keep things fresh as well, with visits to an insane asylum, freakish carnival, and the inner workings of Ray's own mind to name a few . A particular highlight is a theme park-styled trip through his past, and the visuals really help these environments shine. Undoubtedly the most immediately striking aspect of Stick It To The Man, glowing purple hands aside, is its cardboard diorama aesthetic. Part Tim Burton, part Psychonauts; the entire world is stylised to look as though its been folded, painted and carefully carved into shape. Cities resemble complex models with depth and layers, loaded with sheets to pull back a lá Paper Mario. It's quite telling that the majority of the game takes place at night, as there's a vaguely macabre atmosphere to proceedings throughout. Character designs are comical of course, but after dealing with a cannibalistic chef who wants to spice his human stew with ''condensed, liquefied sorrow'' you may forget you're playing this on a Nintendo console. Combined with the script, a biting atmosphere really hits the right side of dark. The Wii U Pro Controller is a compatible option here, but stick with the GamePad and you can take advantage of a quirky feature that sets mind-reading to a simple lift of the controller. Aim for your desired target and their voice will float eerily through the controller's speakers, which actually makes picking an individual out from a crowd a lot easier than attempting to find them with the control stick. 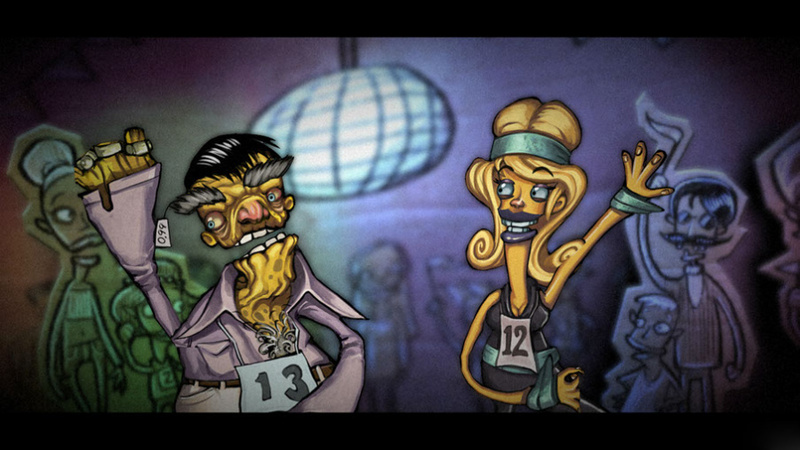 Off-screen play is also fully supported, opening up the further option to tap on brains for selection instead. The big problem is that the entire game clocks in at around five hours if enough time is spent brain-diving, which will understandably cause some immediate alarm for many potential buyers. It's a simple, straightforward experience that won't challenge players too much, but it must be understood that its goal is not to frustrate and test skill levels. 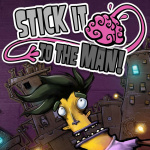 Rather, Stick It To The Man should be enjoyed as a one-off journey into a wholly entertaining world filled with scenarios that just need to be witnessed. 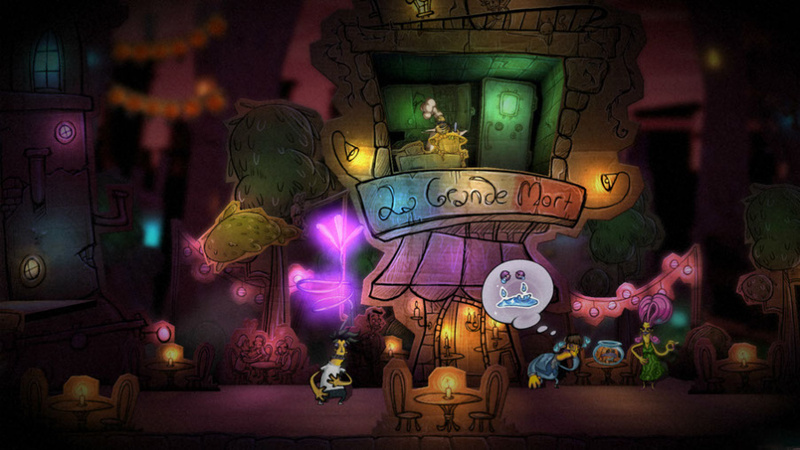 Players seeking a substantial addition to either the platformer or puzzle genre may want to look elsewhere, as the combination of these two elements does serve to slightly dilute both in the process. If the game had been any longer then fatigue may have begun to set in within the next few chapters, but as it stands this is not the case. 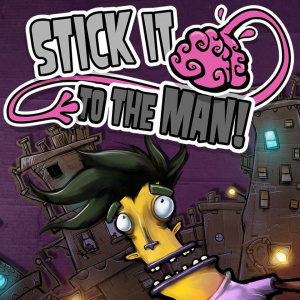 Stick It To The Man invites you into a world of cardboard streets, conjoined luchadores triplets and shady psychiatrists for just a few hours, but within that time are some of the funniest, most outrageous and original concepts seen on the Wii U to date. Its unique blend of psychic gameplay and surreal visuals won't appeal to everyone, but if you want to spend a free afternoon with something completely different then it's well worth a look. Nice review. Thanks for pointing out control options and the length of the game. Sounds like a fun, albeit short, ride. I agree completely with the reviewer. It's so nice that the developers make a port that actually make good use of the Wii U's features, even when the game is budget-priced. Bought it day one but haven't played it yet- waiting to complete child of light. Glad to hear it's good; enjoyable review. Wow!! It looks like everything I was hoping it would be =) shame I'm buried deep in a back log of games at the moment. As soon as I get a few games more finished I'll pick up this, the abyss and child of light as all three look like great original games at a good price with great art styles......happy days! Everything about this game is a joy. I hope we get more games with this art style too cause it looks amazing. Nice to see original games like that coming to the WiiU. Don't have time or money for it now, but I will certainly keep an eye on it and get it if it's on sale. Solid review! I agree completely, though its an 8.5-9 in my book. The game is a blast to play, unless you don't enjoy some quality laughs (sorry Knuckles, you don't chuckle). Great game, I enjoy it! Sale for me as I have enough to play as it is! Ooh! Looks billy ocean's of fun. Will grab this at some point. Ah, I been waiting for this one to be reviewed. I might give download this weekend if I can put down Mole Mania... Good work, Conor! I bought this day one. Other than some glitches, I quite like it. I'd like to see more games like this get released nowadays. @sinalefa Im really looking forward to all the games that you mentioned also. I need to buy an external hard drive now. Good review and good game. Finished it today ironically, The dark, zany story, quirky characters and lol moments made it a worthwhile purchase for me. The grainy filter takes a bit to get used too. Would gladly buy more like it. Got this day one although I don't usually go for these types of games, I bought it on the strength of the developers and I'm glad I did as I really enjoyed it. Great review! Definitely made me want to buy it. I guess I need a HD too, but I haven't taken the plunge yet. The biggest game I have is Giana Sisters at 3.5GB, but I will probably delete it if I need more space in the future. I like my games short and sweet so I'll probably pick this up. Reminds me of 90s cartoons! Got the game Tuesday as apart of the PS+ IGC and have been loving it so far. Provably woudpmt have bought it other wise which would have been a mistake. It reminds me more of a point an click game than a regular platformed. I believe this is free on PS plus this month, so if you have that don't blow your money on the Wii U version. Otherwise, buy this awesome game! Thanks very much, guys! Glad I can spread the word about a real gem on the eshop! I very nearly put in mention of those guys, so I can see why you're surprised. My thinking was to put across the overall mood and setting as a priority , so although they're a regular feature they get a little lost in the shuffle of all the other insanity in my opinion. Perhaps a mention would have been worthwhile though, I can see where you're coming from. Was rich in 2013 and there weren't many games. Now I'm poor in 2014 and there are loads. Video games can rarely make me laugh-out-loud, but this one had me in stitches from start to finish. Hilarious stuff. Highly recommended for that reason alone. Will definitely get it once I'm done with Child of Light. Thanks for the review! Sounds unique & different! I'm aboard! "Free on PS+" yes...."Free". I just need to buy a PS4 and a PS+ subscription and continue renewing the subscription for the rest of my life in order to keep this game. 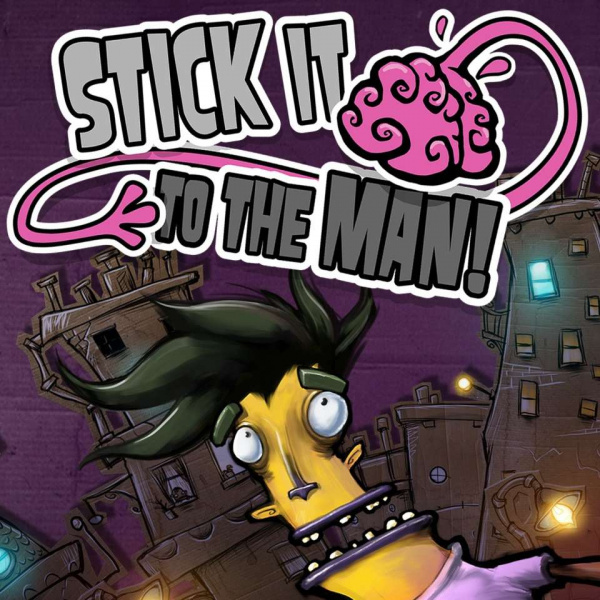 So about $1000+ to play Stick it to the Man ten years from now? A steal...lol. I don't see why 5 hours is a negative...not all of us have time for every single enjoyable game we play to take 111 hours like Pokemon or something. Child of Light is intimidating in it's length considering I'm still powering through Bravely Default! HDD is a must. I grabbed a 500GB WD My Passport Ultra for $49.99 on Newegg. I've still got about 10GB of space left on my Wii U, but the time will come soon enough. And I should note I don't buy ANY retail games digitally. Only VC, indies and digital exclusives. And yet I'm still gonna have it filled up by year's end. If and when you do get an HDD though, try to cap the size at 500GB, maybe even 320GB. EVEN IF you can get a larger size for the same price. Reason being, the larger hard drives have more space, and as such have more space that can experience failure. Fact is the larger HDD's have higher fail rates. 320GB is usually a safe bet, although 500GB are pretty reliable as well. But you start getting up to the 1TB to 2TB range, you're rolling the dice. Just a head's up. Love this game! Right up there with Little Inferno and Runner 2 as my favorite Wii U eshop games. Since it's the price of a movie ticket, the length doesn't bother me. Thanks a lot for the advice. Admittedly one of the reasons why I dont have one is the fear that it will fail. I am writing this from my phone as it seems that my desktop's kicked the bucket after a year, and that was a 1TB. Yeah it happens, but if you limit size to no larger than 500GB you'll be in good standing. And I personally only purchase Western Digital. I've had bad experiences with other brands, particularly Seagate. While ALL brands can fail, even WD, I have personally never had it happen. In fact, the WD 500GB I use for my original Wii is going on 5 years now and still boots strong. But you don't really have to 'worry' about it failing. I mean, you can always re-download the content from the eShop in your download list. And whenever the next generation of consoles arrive, you'll be transferring all those games to the 9th gen Nintendo console anyways, which will certainly have mass storage. Basically, you have no risk of losing the content is what I'm saying. @SecondServing Nah i wont follow your advice i want to support the indie's that makes games for the wiiu. Sounds like some zany fun, and I always like that. Not been in a gaming mood too much the last couple of moments, but I will get it when the itch to play comes back. @R_Champ Dont forget to add the price of the TV, Internet and electricity you'll need. According to your math, videogames are just way too expensive. Don't get me started about the car I'd need to buy if I took up golf! A pity that it is so short! I'll wait till the price goes down! Sounds like the Wii U is the definitive version again. Going to buy it only on Wii U of course! Sounds like one to pick up on sale. Playing through this game these days. Loving it so far. Makes the point-and-click lover in me happy. I bought it a couple of hours ago and so far, so good. The fact that it clocks in at four or five hours is a bonus for me, I don't have much time and these short games are a blessing.